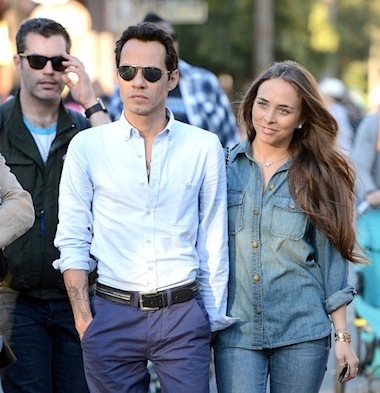 44-year-old Marc Anthony took his new young girlfriend, 21-year-old Topshop heiress Chloe Green, to Disneyland this past week for their first public date. He looks like a fun guy huh? I mean, especially fun at Disneyland, where Chloe likely had to go on all the rides with J-Lo’s twins and not Marc because of the weight limit. Denise Richards took her three children out for some ice cream this weekend. Or two of them ate ice cream while the youngest, Eloise, feasted on what’s left of her mother’s circulatory system. I’ve seen year-old French Bread that was softer than those withered limbs. Swing that thing the wrong way and it either disintegrates or takes someone’s eye out. It’s hard to tell without feeling it in the aquarium touch pool. That kid she’s holding is a vampire with the worst kind of luck. The luck of living with a green drink-loving pilates master when all she needs is Honey Boo Boo’s mom. 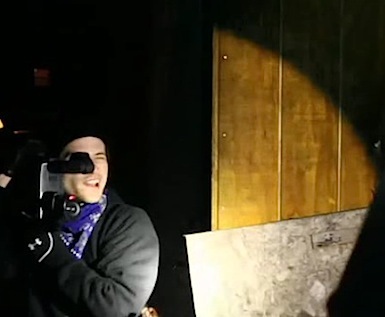 Like most horror fans, I was quite taken with Ti West’s The House Of The Devil, so I was naturally excited when I heard he was going to be a part of a found footage film called V/H/S, even though I’m not normally a fan of the shaky camera POV. No celebrity is safe from death threats, not even the 5’1″ Nova Scotian famous for playing a pregnant teenager in Diablo Cody’s Juno. According to a warrant obtained by TMZ, Ellen Page has received multiple death threats. 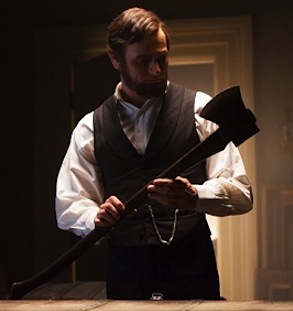 20th Century Fox Agreed To Distribute ‘Abraham Lincoln: Vampire Hunter,’ But Why? People love references to pop culture, the problem is, most of those references have a cheese-like expiration date and eventually become as forgettable as your best friend’s grandma’s name. Like all things written on paper, comic books are declining in sales. They are read by thousands and seen by millions. The Walking Dead and Wanted exceeded expectations, and while Scott Pilgrim vs. the World failed to soar at the box office, it remains a cult favorite of teens and 20-somethings. Jonah Hex, also based on a comic also did poorly despite the casting of Megan Fox and Josh Brolin. But how do movies like Abraham Lincoln: Vampire Hunter and Jonah Hex even get made? 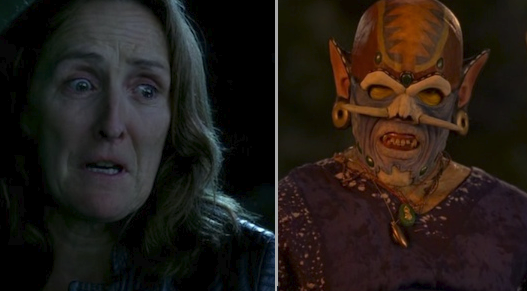 I had the good fortune to notice that Bruce Jenner‘s lookalike was in season five, episode two of True Blood (“Authority Always Wins”). Bruce Jenner, if Kris Jenner finally decided to pour gasoline on him and toss him atop her $5,000 stove. Why do I keep watching the Twilight movies? Am I driven by some cursed voice in my uterus? I don’t know if this is the sad or good part – but I don’t even see them for the Lautner abs or smoldering Pattinson glares, I actually go for the story! 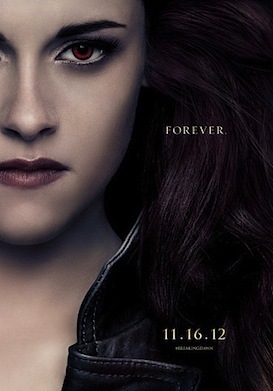 Posters for Breaking Dawn Part 2 just came out and obviously Bella is about to become a vampire, or Kristen got stoned before the shoot and forgot the Visine. 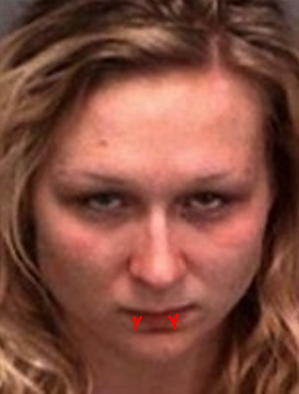 I’m guessing it’s the vampire thing. As a secret fan you’d think I’d have read all of the final installment but I couldn’t find a proper audio book copy. D’oh! Now I’ve revealed that I listen to the audio books, watch the movies for the “story” and don’t care about the abs. I’m going to non-hipster hell. What would that be? I suppose it’s full of Bieber fans holding Care Bear blankets. I’ll fit in. Johnny Depp has played a pirate, a talking lizard, a demon barber, Ichabod Crane, Ed Wood, Don Juan, Willy Wonka, The Mad Hatter, Edward Scissorhands. Oh, and he made his debut in Nightmare On Elm Street. Now he’s taking on a role more versatile than any, a vampire. 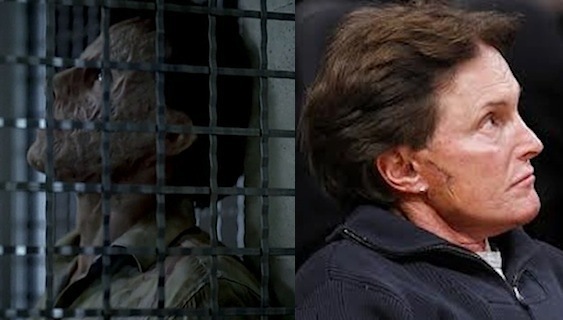 Everyone in Hollywood from Brad Pitt and Tom Cruise to Gary Oldman, Kiefer Sutherland and Kate Beckinsale have filled those bloodsucking shoes. 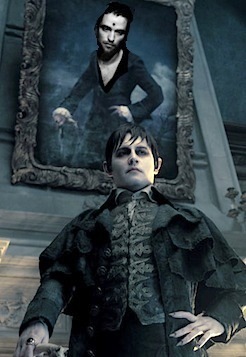 The latest is Depp in the eerie 70’s comedy Dark Shadows. At the London premiere he took a shot at one of the most lusted after vamps of recent years, Robert Pattinson. Dark Shadows was a TV series that ran from 1966-1971. A vampire soap opera (starring Jonathan Frid) that wasn’t quite as popular as The Munsters and The Addams Family. The summary quote for the finale occurs when a crap load of ghosts come out of the woodwork, including Sookie’s gran, Marnie, Antonia (the ancient witch) and later Rene and one of the people who died in the episode. Ellis, age 69, had met the woman earlier in town at a Shell gas station while she was supposedly waiting for one of her relatives to pick her up. During my boring Regal Cinemas Fright Night soirée on Saturday, I was lucky (or unlucky) enough to see the new trailer for Underworld: Awakening, the fourth installment in the Underworld vampire/werewolf series starring Kate Beckinsale. Beckinsale was absent in the third movie, and has made what I assume to be a welcome return to Awakening, due in out in 3D, in the year of the supposed apocalypse – 2012. Underworld without Kate B is like Resident Evil without Milla J! Guess what? 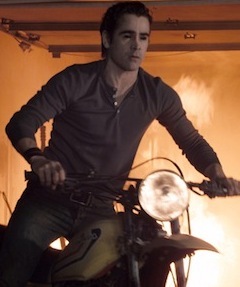 I just got back from spectating the new Fright Night remake in 3D, starring Colin Farrell and Anton Yelchin, and guess what else? (This is an easy one) It wasn’t very good! Mueller Report Mystery: Why Is Sergey Shoygu, Russia’s Defense Chief, Mentioned One Time With No Explanation?